You’re watching your favorite artist tear it up on stage. They’re totally into it and the crowd goes wild. The musician in you is feeling every bit of the thrill and you’re soaking it in. He pulls away from the mic and points to the crowd and they shout the lyrics just as loud as the PA and a few guys on the band pull something out of one of their ears. You see them do that and wish that you’re gig will eventually get big enough that you’ll be able to play places where an in-ear monitoring system is available to you. Good news my friends -- your goal of being able to use in-ear monitors gets more and more obtainable. Most artists have custom molded in-ear monitors (also known as IEM’s) that fit into their ears perfectly. Unfortunately, they are extremely expensive and the average musician simply can’t afford it.Fortunately, there are affordable and quality alternatives that the average musician can use. I work for National Community Church, which meets in seven separate locations each weekend, and I needed to purchase new IEMs for some of our locations. Because I needed to buy so many, price was a serious factor. So before buying just anything, I decided to try out a few different models before making a purchase. One setup that impressed me was the Shure SE series. I purchased the SE115’s and SE215’s. As I unboxed them, I noticed that the actual cable on the SE115s was short, with only about 12 inches of cable on it, before terminating at a 1/8 inch TRS connector. Also included was an extender made of moderate-quality cable, which plugged into the headset. This is a great idea because it helps to protect the IEMs themselves if you get the cable caught on anything and it gets yanked. Instead of ripping the headphones out of your ears -- or worse, snapping the cable out of the bottom -- it simply unplugs. It’s also helpful if you need to exit the stage and don’t want to leave your in-ears laying on the stage. You can simply unplug the extender and take the headphones with you. They came with a few different earbud attachments, which I found to helpful in customizing them to fit comfortably in anyone’s ears. There were both small and large rubber ends as well as foam ends that could be washed and reused. When I put them in they fit pretty snuggly. The only problem I had is that I had a hard time getting them angled correctly in my ears so that they would perform properly. I had to reposition them more then I would prefer. The frequency response is pretty solid -- although after using them for a few days, I would compare their overall sound to that of a higher-end consumer ear bud. I will say they are good for the money, but not outstanding. I unboxed the Shure SE215s and immediately as more impressed. They featured a different type of detachable cable. Instead of having a short cable terminating in a 1/8 inch jack, they have a small metal end that detaches directly from the base of the individual IEMs themselves allowing you to replace the cables on the buds without buying a whole new pair. Honestly, I think its way better then the SE115 design. Also, the cable on the SE215 is reinforced with Kevlar, making it stronger and tougher. The SE215’s had the same earbud attachments as the SE115’s. The difference in the design between the SE115’s and SE215’s is huge for me. The SE215’s feel much more comfortable and stay firmly where I position them in my ears, even when I move around. Once I found the position in my ears where they would perform optimally, I didn’t need to readjust them nearly as much as the SE115s, and they felt much more natural. This is partially due to the difference in the cable itself as well as the sleeves near the earbuds, which have a small wire in them keeping the cable around your ear stiff, creating a better fit. The performance and sound of the SE215’s was like night and day better when compared to the SE115s. What struck me right away was just how much clearer they sound in the higher frequencies. Then, the bass kicks in and I was pleased to hear a pretty solid low-end presence without distorting or making the low-mids muddy. As I pushed the volume higher, they stayed clear and crisp without getting harsh which, in my experience, is not common in cheaper in ear monitors. Overall, I was pleased and surprised with the newer improvements that Shure has made to their in-ear monitors over the past years. They have kept improving quality while still maintaining the same relatively affordable price range. I must say the SE215s are leaps and bounds better then the SE115s, for just a modest price increase (about $69 street price for the 115s, $99 for the 215s). Great sounding on stage in-ear monitoring is no longer out of reach for the average musician. 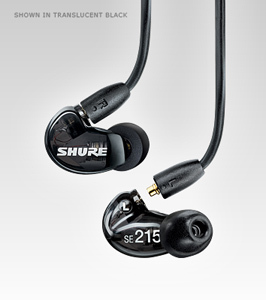 Check out the Shure SE series headphones today.